With food and hospitality reminiscent of home, Metropolis Café welcomes you as family. Conversations are intimate and flavors comforting while dining in this former ice cream parlor turned neighborhood favorite. The candlelit dining room, with its original tin ceiling and copper bar, boasts the ideal silhouette for your first date or fiftieth anniversary. The South End's original brunch spot, Metropolis bustles on both Saturday and Sunday when neighbors line up religiously to enjoy Boston's Best Brunch. The friendly nature of the Metropolis staff will make you feel as though you walked into a restaurant you have frequented for years, even on your first visit. 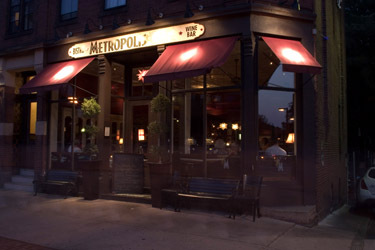 Metropolis Cafe has been recognized both nationally and locally. The New York Times wrote that they "just didn't want to leave" after a trip to Metropolis and listed it as one of their favorite restaurants in Boston.